Charles McLimans has led as President and CEO of The River Food Pantry since 2017. Focused on moving The River into a larger location and expanding its services by 2020, he oversees all organizational strategies, while facilitating collaborative opportunities to achieve a fully nourished community. Prior to The River, McLimans had served as the president and CEO of anti-hunger organizations including Feeding America Eastern Wisconsin—Wisconsin’s largest food bank—and Loaves and Fishes Community Services—a leading hunger relief and anti-poverty organization in the Chicago area recognized for its innovative food and collective impact programs. 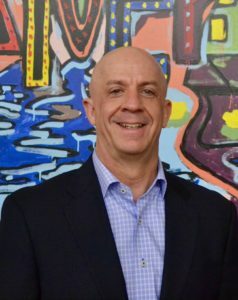 McLimans began his quest to solve hunger in 2006 as a volunteer with Loaves and Fishes, whose board of directors ultimately asked him to lead the organization. For the past 12 years, McLimans has successfully guided and inspired aggressive, innovative and visionary solutions to food insecurity and poverty issues. McLimans attended the University of St. Thomas in St. Paul, Minnesota, and the University of Wisconsin-Madison. With decades of both corporate and nonprofit experience, McLimans credits his success as a nonprofit leader to having worked on both sides of the philanthropic coin and to the work ethic he learned from his parents growing up on a dairy farm in Southwest Wisconsin.